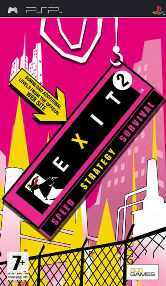 The addicting EXIT video game is an action plus puzzle game for Sony PlayStation Portable (PSP), with versions for Xbox Live arcade and Nintendo DS coming soon. Gamer or player plays the role of Mr. ESC, a professional rescuer or escapist whose job it is to overcome several obstacles or numerous life-threatening situations such as fires, earthquakes, flood, explosion, and other disasters, and escape the from the places such as buildings, offices, hospitals, underground structures and subways, saving trapped people along the way. EXIT game features a unique art style to help make the characters and backgrounds look stylish and eye-catching. Mr. ESC can run, jump, swim, move objects, climb ladder, climb onto ledges, climb down ropes, or collect rescue devices, and is prone to injury from hazards such as get struck by falling object, get burned or falls from too high, where the mission is unsuccessful and the level is over and must be restarted. If the player unable to complete the mission (fail to exit the ending exit point) in time frame required, the mission is also failed. When mission is completed, a maximum of 100 points score is given based on the number of people rescued, and the par time for the level. To success in playing EXIT, players have to has quick thinking and good planing to move around the setting so that Mr. ESC can get everyone out in time without injured. There are many situations in EXIT. The following unlock cheat codes hack will unlock situations 8, 9 and 10. Note that to unlock Situation 9, Situation 8 must first be unlocked. The same to Situation 10, where Situation 9 must first be unlocked.